League tables do nothing to help improve the lot of an individuals broadband but can sometimes stir firms, politicians and regulators to try and shift the figures they are focusing on further up the chart. 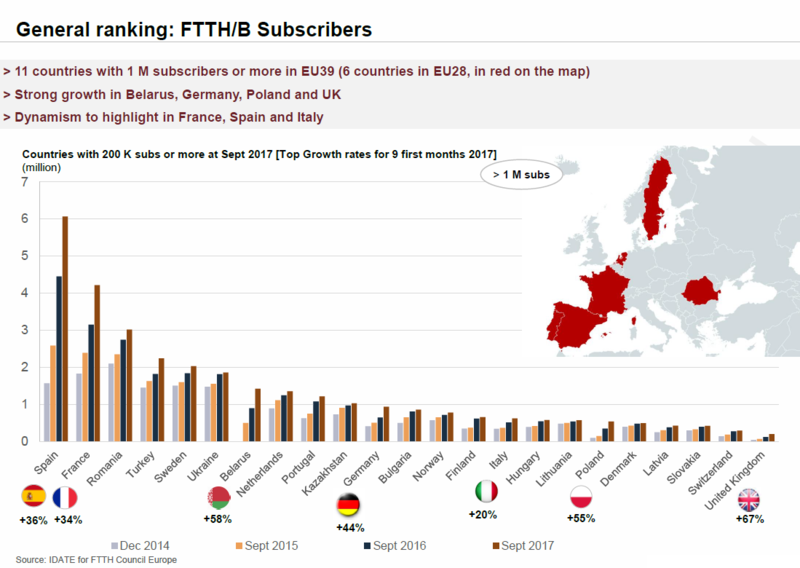 The FTTH Council EU which is holding its annual conference in Valencia, Spain has published its annual FTTH/FTTB penetration data compiled by iDate - the presentation PDF is available for those who want to read the background notes. 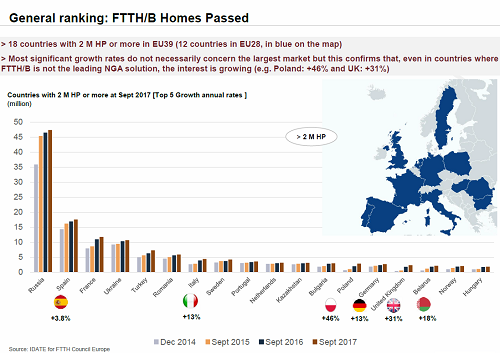 The UK is not present because the chart has a cut of 1% and while our coverage of full fibre has the UK at 2.6% in terms of homes passed and this would have needed a take-up rate of around 38-39% to hit the 1% and thus we may have just missed out. Of course full fibre coverage is not standing still, e.g. in February 2017 it was 2.3%, September 2.6% and today is 3.4% so this should really be the last year we don't make the charts at all. iDate has not ignored the UK, where is some useful data for those wanting to see what is happening and thus compare to other EU countries and they have two charts for homes passed and subscribers. The glimmer of hope for the UK is that we make it into second place for the percentage change in homes passed, 31% versus 46% of first place Poland. Of course when you are going from amount of coverage any change tends to be a high percentage, but if the various plans for 3 million and a couple of batches of 1 million are delivered by 2020 from various players this change is going to increase. The subscriber numbers chart actually has the UK leading with a 67% change in subscriber numbers. A final graphic is an interesting one, the percentages for the UK are different, since for all the expansion noise from alternate operators, Openreach still is the largest FTTP operator, but what is interesting is the change in the interest of incumbents in rolling out full fibre, a jump from 21% to 42%. So the relative slow roll-outs of full fibre by BT Openreach appears to be similar for other incumbents across Europe and the UK has suffered from the very late entry of alternates like CityFibre.